So I supposed we can only wait and hope that it will be as they say. There’s almost certainly going to be some kind of DLC or something that can bring in a little more coin for them. But I suppose so long as it is a single-player game with no microtransactions and loot boxes, it’s a step in the right direction for EA. Interestingly enough the game is developed by Respawn Entertainment, who is best known for making online multiplayer games. They made Titanfall and its sequel, as well as the recent battle royale title Apex Legends. There is plenty of talent with single-player experience working on Star Wars Jedi: Fallen Order, however. It’s written by Chris Avellone, and directed by Stig Asmussen. Avellone has worked on the Fallout series, the Baldur’s Gate series, the Neverwinter Nights series, Pillars of Eternity, the recent Prey reboot, and much more, but most importantly, he was lead designer and writer on Star Wars Knights of the Old Republic II. Asmussen worked on the God of War series before joining Respawn. The game also has some star power. It was revealed that the voice and performance capture for the main character, named Cal Kestis, is provided by Cameron Monaghan, star of Gotham and Shameless. As you’ll recall, there was a single-player Star Wars game on the way from Dead Space developer Visceral Games led by Uncharted director Amy Hennig. It was a game that looked pretty darn promising and had fans extremely excited. But alas, EA decided to kill it off along with Visceral and our hopes and dreams. But unlike Visceral’s game and the deceased Star Wars 1313 (it still hurts), it looks like we don’t have to worry about this one being teased to us and then murdered without remorse. 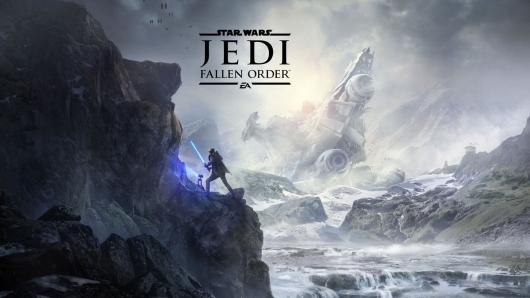 That’s because Star Wars Jedi: Fallen Order is being released this year, on November 15th. If this is all enough to sell you, the game is available for pre-order now. It’s available in a Standard Edition (PS4, Xbox One) and a Deluxe Edition (Xbox One, PS4). It will also be available to PC players. Me personally, I’ll be waiting patiently to see and learn more before buying into this one. Consider me cautiously hopeful. With the release coming so soon, one has to wonder if we’ll be seeing some gameplay around the time of E3 2019 this summer despite the fact that EA has said they’re not doing an E3 showcase this year. Stay tuned.